Action in the Lipa Football League. Lipa City, 24 November 2018 – With Mentors FC and ACF Real Molinillo de Lipa, leaders of Groups A and B, respectively, both idle tomorrow, 25 November, the groups’ second-placed teams seek the top spots against separate opponents in the third round of Lipa Football League action at the Aboitiz Pitch of The Outlets at Lipa. La Salle FC, majority of whose players won the silver medal with the City of Lipa in the recently concluded Batangas Inter-Division Meet in Batangas City, tangle with opening round losers Coffee Millers FC at 3:45. The Millers are still without a point, having sat out the second round with a bye. La Salle needs just a draw to nudge ahead of Mentors FC in the group standings. The youngsters will have to be at the top of their game against the Millers, however, who despite the 2-4 loss to the Mentors on opening day have among the league’s most experienced players. Meanwhile, Green Stallions FC, who debuted with an 11-2 rout of Kings FC in Round 2, are just a point behind current leaders ACF Real Molinillo de Lipa with three points, ahead on goal difference of their opponents tomorrow, the youngsters of Lipa Emmanuel FC. A draw will be enough to send the Green Stallions top of the Group B table ahead of Real Molinillo on goal difference. The match between the Green Stallions and Lipa Emmanuel commences at 2:45, with the latter also hoping to bounce back from a 1-7 mauling at the hands of Real Molinillo. In the other 2:45 match, defending champions FC Reigning Kickers square off against Legends FC, both teams hoping to win their first points of the current season. The defending champions have had a wretched start to the season, losing heavily to La Salle FC and Mentors FC in their first two matches. Legends FC, meanwhile, debuted in Round 2 with a heartbreaking 3-4 loss to La Salle FC. In the final match of the afternoon, LFL guest team Real Barako FC tries to get its campaign back on track in the 3:45 encounter with pointless Kings FC. 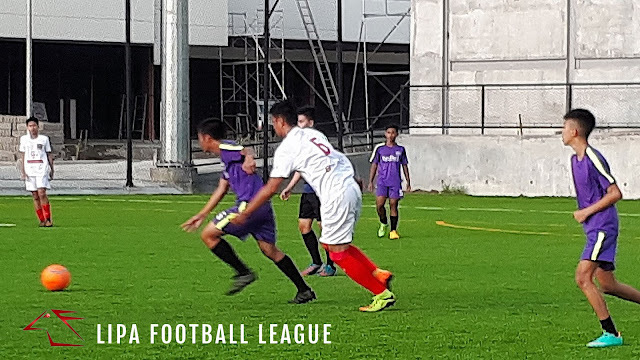 The Batangas City-based club was trailing Real Molinillo 1-2 in the first round but equalized with a late goal to earn a deserved draw. Kings FC is anchored at the bottom of the table with two straight losses, its 2-11 defeat at the hands of the Green Stallions giving the young team a worrisome -10 goal difference. The Lipa Football League is presented by ACF Real Molinillo de Lipa and The Outlets of Lipa, with sponsorship by El Abyador Garden Pool Resort.